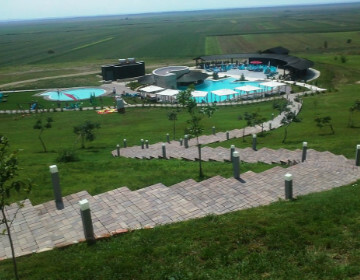 Greaca Domain is located 45 km south from Bucharest, in Greaca Village, Giurgiu County. Greaca Resort covers ​​32 hectares and it is the perfect destination for a relaxing weekend out of Bucharest. The resort includes accommodation in a lovely mansion hotel, a restaurant with Romanian and Mediterranean cuisine, a Wine Cellar, a tennis court and two outdoor swimming pools. The resort also organizes ATV riding, hunting and fishing on the Danube, which is only 5 kilometers from the mansion. Bucharest Tips team has reviewd Domeniul Greaca Resort - Sport venues in Bucharest. You can get here description, reviews, address, map, phone, website of Domeniul Greaca Resort in Bucharest. Visit Buchareset Tips for more Sport venues in Bucharest!